The first one was arguably was Marvel’s biggest surprise so far (and also their biggest gamble, which paid off tremendously). A fun, epic space-action-romp with wonderful, original characters and an incredible sense of fun, but also a lot of heart and soul. Thus, “Vol. 2” has some huge shoes to fill. What’s more: Where the first one came out of the blue, people’s expectations are a lot higher this time around. However, I’m glad to report that in my book, “Vol. 2” is on par with its predecessor. Granted, it’s not quite as fresh and original as the first one. They also go a little overboard with the action, especially during the finale, which is one of those typical superhero-CGI-fests, and thus its most common and least appealing trait. Not to mention that once again, the entire galaxy has to be saved; personally, I would have preferred smaller odds (like the Guardians just fighting to save Peter). The music mix is also mostly inferior; with the exception of the last song – which is not only great in its own right, but is also used extremely well – I found the tunes in the first movie to be much more iconic and catchy. And the story in “Vol. 1” seemed to have a little more momentum and was more varied, thanks to all those different locations we visited and characters we met along the way. However, all those shortcomings are made up by the much more personal story, more character depth and development (which is especially true for two previous adversaries, Nebula and Yondu), and especially one emotional moment at the end which was the saddest, most touching and heartwarming scene the MCU has offered so far. When a friggin’ racoon almost makes you cry, you know that you’re seeing something very special. And the rest of the movie is just like (and as good) as the first one: I’m still in love with – and awe of – all the characters. From the current Marvel-lineup, the Guardians definitely are the most fun to be around. Also, Vol. 2 once again is full of surprises, gags, and funny moments. However, despite all the humor, it never gets superficial and/or loses its focus, which lies always on its characters. And even though there’s plenty to laugh about, and despite all its goofiness, there’s an earnestness and weight to the proceedings which makes this so much more rewarding on an emotional level than your usual superhero roundup. Come for the laughs, stay for the heart. 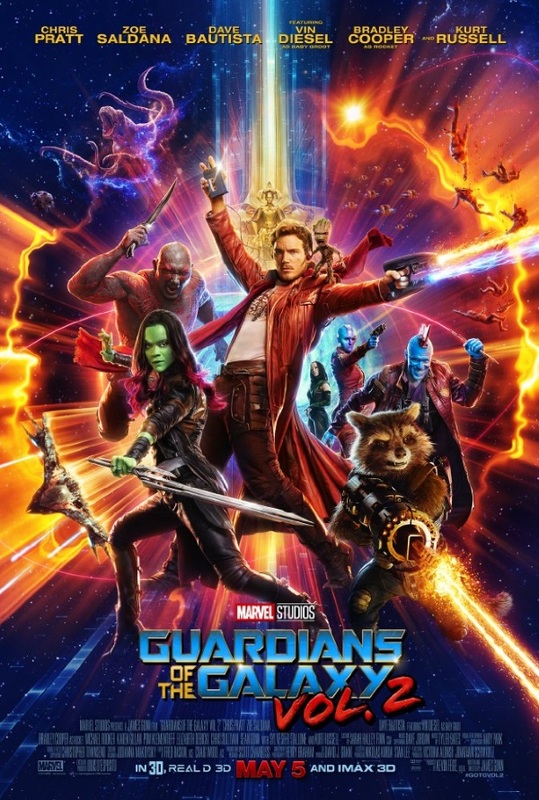 This entry was posted in cinema 2017, movie reviews, new releases and tagged Bradley Cooper, Chris Pratt, Dave Bautista, disney, Guardians of the Galaxy, James Gunn, Karen Gillan, Kurt Russell, Marvel, Michael Rooker, Pom Klementieff, science fiction, Sylvester Stallone, Vin Diesel, Vol. 2, Volume 2, Zoe Saldana. Bookmark the permalink.